WARNING: We do not recommend FXCM. This is due to a membership ban by the National Futures Association (NFA). Please consider one of the alternative CFD brokers below. Does FXCM Offer Sign Up Bonuses? PLEASE NOTE: We do not currently recommend FXCM (see why), see updates to our review below. Please consider one of our other regulated brokers. FXCM was one of the first firms to offer forex trading to retail traders and one of the early innovators in the online brokerage business. The firm’s focus on the expanding retail marketplace enabled it to grow rapidly over the years. FXCM offers a first-rate FX trading platform and provides excellent customer service and educational resources. The company’s No Dealing Desk model provides customers with very competitive spreads. FXCM has received recognition and awards for its tremendous growth. The company was honored as one of America’s fastest growing companies by Inc. 500 in 2004, 2005, 2006 and 2010. The company has also been recognized for its excellence as a broker and online platform. The UK Forex Awards recognized FXCM as best forex broker of the year in 2013 and honored it for best trading station automation in 2015. In 2013 Money AM named it best online FX provider, and the company received honors as best FX provider at the 2015 Online Personal Wealth Awards. This FXCM review will provide an overview of the company and discuss the broker’s major advantages and disadvantages. FXCM was founded in 1999 in New York and pioneered online FX trading for retail customers. Prior to FXCM, forex trading was viewed as a market solely for professionals. FXCM is responsible for changing that perception. In 2003 FXCM expanded overseas and opened an office in London. As a trading firm operating in the UK, FXCM receives regulatory oversight from the UK Financial Services Authority. By 2005, the retail online forex trading market began to grow rapidly and attract a number of new participants. Most of these firms operated with a dealing desk or market maker model where brokers would take the other side of customers’ trades. This model created the perception of a conflict of interest between the broker and its customers. Beginning in 2007, FXCM created a No Dealing Desk model. The firm executed its customer orders with independent market makers. As a result of this customer-first approach, FXCM grew its retail business and acquired many smaller players. FXCM offers customers 24-hour support 7 days a week. Customers who need assistance can reach the company by toll-free phone (agents speak 20 languages), fax or email. The FXCM website supports several languages and the firm offers live chat help to customers. South Africa: FXCM South Africa (PTY) LTD.
As an international trading firm, FXCM is regulated by agencies in several jurisdictions where it operates. The firm’s registration with the UK’s Financial Conduct Authority (“FCA”) allows it to do business in other EU member states including France, Germany, Greece, and Italy. FCA regulation requires FXCM to segregate all retail client account assets from the firm’s money. In the event that FXCM were to become insolvent, the firm would not be able to use clients’ assets to pay its creditors. If for any reason the firm were not able to pay customer claims, eligible customers can receive compensation through the Financial Services Compensation Scheme. FXCM’s subsidiaries are regulated by local authorities in the regions where the firm operates. The Australian Securities and Investments Commission regulates the firm’s Australian operations, while the Financial Services Board oversees the firm in South Africa. On February 6, 2017, the National Futures Association (NFA), a US regulatory agency, banned FXCM from membership citing “numerous deceptive and abusive execution activities that were designed to benefit FXCM, to the detriment of its customers.” Essentially, the NFA accused FXCM of sending its customers’ orders to an FCXM-owned subsidiary called Effex for execution. Effex, in turn, sent rebates for this order flow back to FXCM, and FXCM allegedly concealed these payments from NFA. In addition, NFA alleges that Effex defrauded customers by executing their orders in a way that benefitted FXCM egregiously at their expense. On February 6, 2017, FXCM agreed to pay a $7 million penalty to settle a suit by the Commodity Futures Trading Commission (CFTC) another US regulatory agency. FXCM subsequently withdrew its registration with the CFTC as part of this agreement, which left it unable to operate in the US. On November 10, 2017, Global Brokerage Inc., a publicly traded company on the US NASDAQ exchange, announced a reorganization bankruptcy plan under Chapter 11. Global Brokerage Inc., through a subsidiary, owns a majority stake in FXCM. Both Global Brokerage Inc. and FXCM assert that FXCM customers and their assets will not be affected by the reorganization. The underlying instrument is the BUND (the Euro-Bund Futures Index portfolio), which holds the nearest maturity Euro-Bund Futures contract and consists of German government bonds. The FXCM platform offers trading in 39 different currency pairs. FXCM gives traders in the UK and Ireland access to spread betting as well. Spread bets are commission-free and tax-free to UK and Ireland residents. Traders can use leverage as well on spread bets. FXCM offers three different account options for traders – mini, standard or active trader. All FXCM account types come with access to FXCM’s 24/7 support and all of the site’s educational materials. Traders with a mini account can trade the markets with as little as a £50 deposit and can employ leverage of up to 200:1. With a mini account, forex traders can trade 21 currency pairs and 18 index/commodity instruments. Unlike standard account traders who get no dealing desk executions, mini account holders have their orders executed by the dealing desk. The mini account is ideal for new traders. Standard accounts are for more serious traders who want anonymous order executions and no trading restrictions. Standard accounts require a minimum balance of £10,000 and offer forex leverage of up to 100:1. Active trading accounts are for professional traders who require the best custom trading solutions. Traders must have a minimum balance of £25,000. Active traders receive no dealing desk trade executions and are eligible for volume trading discounts. FXCM commissions charged for standard accounts are £30 per million for EUR/USD, GBP/USD, USD/JPY and USD/CHF and £50 for all other pairs. The type of FXCM account determines the size of the minimum deposit required. A mini account can be funded with a minimum of £50 while a standard account, which provides better execution and more trading options, requires a minimum deposit of £10,000. Active trader accounts, which have the lowest costs and are eligible for other benefits, require a minimum deposit of £25,000. Traders choose their country from a drop down menu during the setup process of opening an account. At this point, FXCM asks traders to choose a currency denomination for their account. Depending on the country of origin, traders may have more than one option for currency. FXCM recommends that traders choose a denomination that matches their bank account. FXCM’s primary customer base is in the UK, Germany, Australia, France, Italy, Greece, China and Japan, but regional partners give the firm a presence worldwide. The firm does not currently offer trading to US customers. Traders also receive their leverage settings during the signup process. New traders are set up with 50:1 leverage while more experienced traders can choose up to 200:1everage on a mini account or 100:1 setting with a standard or active trader account. The FXCM margin requirements for each type of account vary as market conditions, volatility and currency rates fluctuate. Margin amounts are calculated as a percentage of the notional value of a currency pair and get adjusted as the currency moves up and down. FXCM provides real-time information on usable margin and used margin so customers can track their FXCM margin requirements and adjust their trading accordingly. Customers can make account withdrawals by credit or debit cards such as Visa or MasterCard without incurring any fees. FXCM charges bank wire withdrawal fees of $40, but there’s no minimum or limit to withdrawal amounts. Withdrawals are usually processed within a few business days. The FXCM Trading Station platform is an innovative and comprehensive platform that is designed to appeal to both novice and experienced traders. The platform provides desktop, web and mobile access. Experienced traders have access to a wide range of customizable functions, while new traders can begin trading with just a few clicks. The appealing graphic interface makes the platform intuitive and easy to grasp. Signing up for the Trading Station platform is easy. Traders enter their name, email address, their currency of choice for funding the account and choose whether they want an individual or joint account. After entering their personal information and choosing an account type, traders are brought to a page where they are assigned an account number login and password. Traders can now deposit funds and provide identification documents for their account. At this point, they can log into the Trading Station platform. 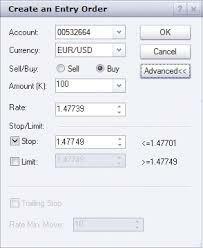 Main menu bar: The key items under the main menu bar are the trading and charts sections. When clicking on the trading tab, the trader has the option to enter an entry order with a limit, a market order, a stop order, a stop order with a limit or an OCO order in which one order cancels another. The charts section under the main menu bar gives the trade the ability to chart a security using different technical tools including oscillators, Bollinger bands, moving averages, and candlesticks among other choices. Dealing Rates Window: This window displays bid / ask levels for all currency pairs available for trading. When a trader clicks on one of the pairs in this window, a ticket opens for entering a trade. 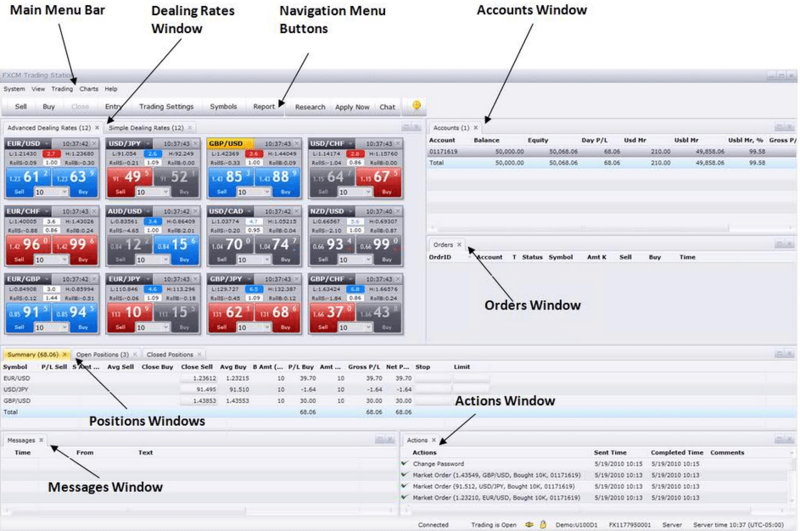 Navigation Menu Buttons: These buttons allow traders to customize their trading experience by creating customized screen layouts, unique charts and specialized settings for trade tickets. While many of Trading Station’s features are standard with more basic platforms, these customizing features are generally found only in platforms designed for more sophisticated traders. Account Window: This window shows the details of the account including equity, daily P&L, margin used and margin available for use. Order Window: This window shows the trader’s open orders including the status, symbol, number of shares, whether it’s a buy or sell and the time of order entry. Positions Window: Traders can use this window to track open and closed positions and a summary of their daily activity. Messages and Action Windows: These windows allow the trader to track actions taken and for the system to notify the trader of any important announcements. Many of the features available on the main screen are similar to those available from other CFD brokers. This should make Trading Station familiar to traders migrating from another platform. However, the software beyond these basic features is what makes Trading Station special. FXCM Trading Station offers the ability to customize all of the content it displays. While many other brokers also offer these features, Trading Station provides unique customization tools that are robust and easy to use. FXCM provides its customers with over 600 indicators that can be added to the trading screen. Traders can download these indicators and add them as navigation buttons. Once a trader gets the hang of using these tools, the positive user experience of this platform becomes clear. If traders want customization beyond what FXCM offers, they can develop their own tools. FXCM allows users with programming experience to custom build their own features using the firm’s API. 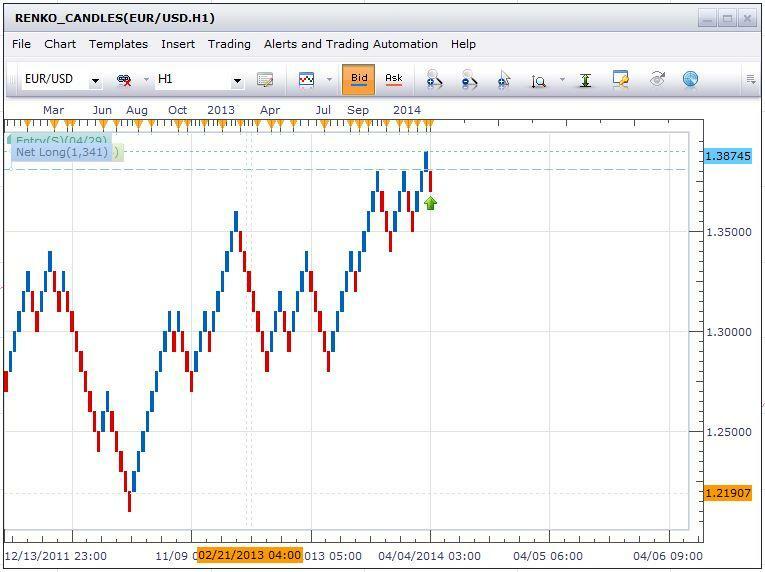 This extra functionality demonstrates that FXCM truly is a platform for the most sophisticated traders. 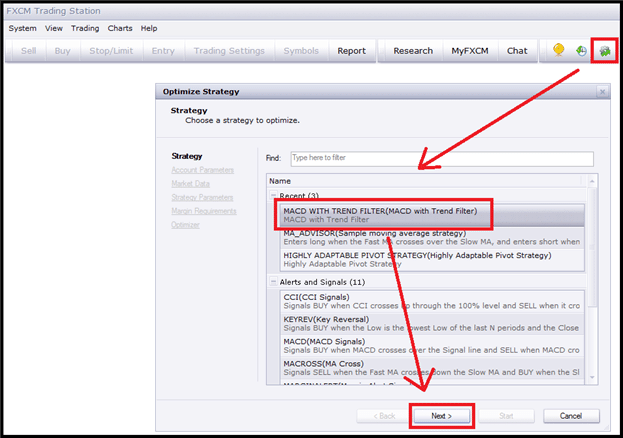 Now traders click on the strategy they want to optimize with backtesting. The trader will then be taken to a screen to choose a currency pair, a time range and the parameters for optimization. The results of the optimization are displayed in a table. This powerful analytical tool allows traders to quickly pinpoint parameter combinations that create profitable trades. FXCM has created an online marketplace of apps to support its Trading Station platform. FXCM account holders can download these apps and customize their trading experience. Apps cover all types of trading strategies and styles. The marketplace offers apps for fundamental traders, trend traders and range traders among other categories. Both demo account and real account holders can access these apps. Automated Strategies– apps that automate all or part of a trading strategy. Indicators– apps that calculate market data and show the output on a chart or graph. Moving averages and Bollinger bands are two types of indicators offered through apps. Add-Ons– apps that enhance the functionality of a chart. For example, there are add-ons that show past and upcoming news announcements displayed on a chart, while other charts can transform standard candlestick charts into Renko charts. 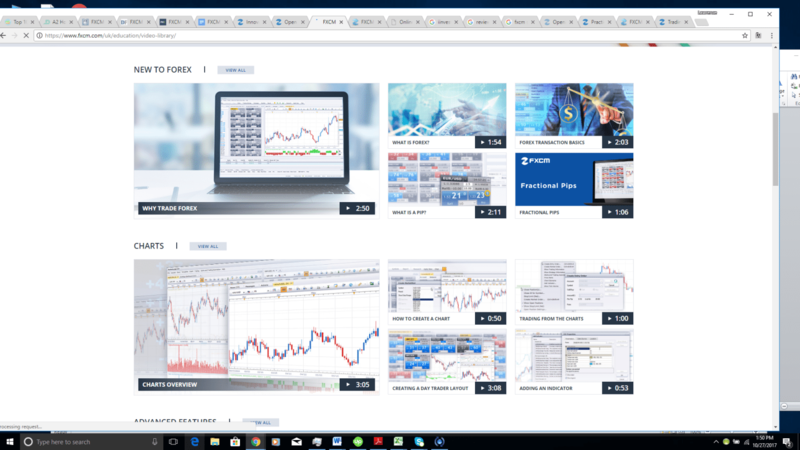 FXCM offers a vast array of educational resources that will benefit both new and experienced traders. 1) FXCM University: This comprehensive Forex 101 online University course covers everything from explaining forex to chart reading to risk management. As with a university, the course is divided into freshman, sophomore, junior and senior years with increasingly more challenging content as the student progresses. 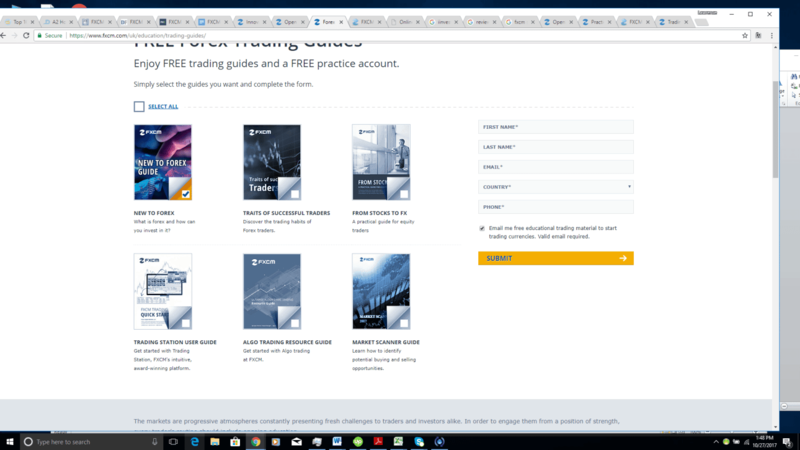 2) Trading Guides: These free trading guides offer insights into trading. 3) Video Library: This comprehensive library covers market educational topics through short and informative videos. 4) Seminars: These sessions take place every Wednesday after 6 pm and alternate between beginner and advanced sessions. Every trader, including those with demo accounts, can participate, but attendance is limited to 10 per seminar. 5) Live Classroom: These webinars allow attendees to ask questions via chat to the moderators, who cover a variety of FX topics. As with a live account, the demo account gives plenty of screen real estate to customize the platform to the trader’s needs. PLEASE NOTE: We do not currently recommend FXCM. Please consider one of our other regulated brokers.